In which countries are people kindest to strangers? For more information watch the Investing in Peace session from the World Economic Forum's Annual Meeting 2017 here. After a year of depressing headlines, you’d be forgiven for questioning your faith in humanity. So maybe this piece of good news will help: more people than ever before are carrying out random acts of kindness towards strangers. Those are the uplifting findings of the latest CAF World Giving Index, an annual report that tracks levels of generosity around the world. “For the first time, more than half of those surveyed say they helped a stranger – a testament to the innate human desire to help others whenever they are in need,” the report notes. 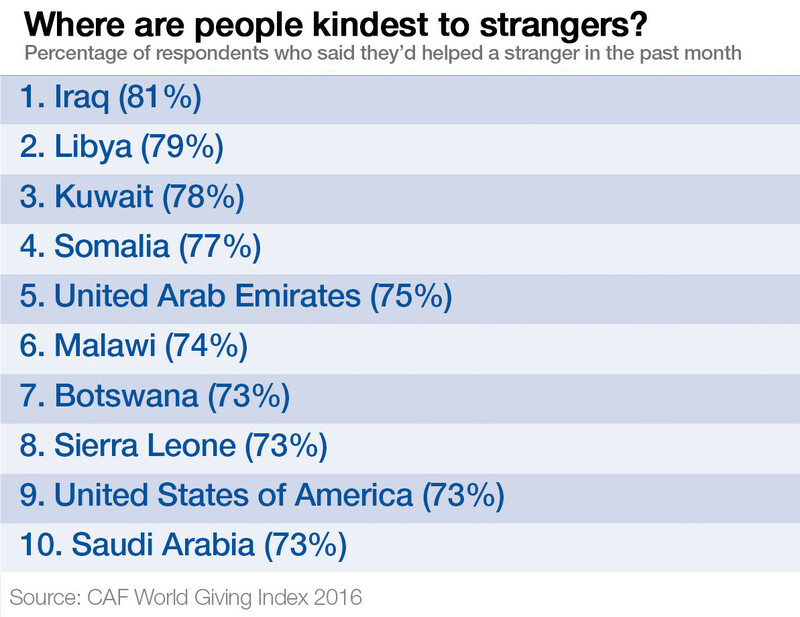 An even more interesting picture emerges when the results are broken down by country: those people living in some of the most dangerous, unstable places in the world are also the most likely to offer help to a stranger. Of the global top 10, four countries are towards the top of the Fragile States Index. And in the two leading countries, Iraq and Libya, citizens have had to endure years of conflict, terrorist attacks and general unrest. Even before war erupted, both countries had a strong culture of community support, BBC reporters based in the region point out. If anything, though, the suffering citizens have been exposed to in recent years has strengthened that resolve to help others. Before the civil war in Libya, 72% of people in the country said they’d helped a stranger. Today that number stands at 79%. While we might expect a collective crisis to bring out the worst in people – think opportunistic collaborators or war-time looters – it seems that most people rally round and support others. “It appears that increasingly fragile civil societies, coupled with greater need among the population, encourages more people to be responsive out of sheer necessity,” the CAF report argues. This optimistic take on human nature is more than just wishful thinking: there’s some scientific evidence to back it up. In 2012, researchers from the University of Freiburg found that contrary to received wisdom, stressful group situations actually bring out the best in people: “Stress exposure increased trust, trustworthiness and sharing behaviour in social interactions,” the study concluded. Another reason to feel that little bit more optimistic, in spite of the negative headlines.